Maryland police are calling him the "Bad Luck Bandit"
An attempted burglary in Suitland, Maryland, went all wrong when the suspect's brick ricocheted off bulletproof glass and smashed into his head. Police are calling him the "Bad Luck Bandit." The suspect shattered the front glass to get inside a waiting area of a takeout restaurant, police said. Surveillance video shows him then trying to break through a window to a back room. The suspect lobbed the brick once, then twice, but the bulletproof glass resisted. He wound up his pitch for a third attempt and flung the brick to the window. It bounced back. The suspect flinched, but it was too late. The brick smacked him in the head, sending him to his hands and knees. He tried to pick himself — and the brick — up again, before realizing the extent of his pain. 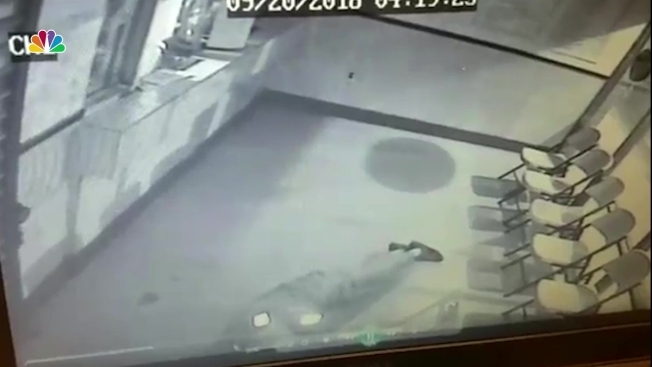 Video shows the suspect rolled back, lay down on the restaurant floor and stayed there. Police say he was on the ground for several minutes before giving up and leaving. Prince George's County police are looking for the suspect. He was in the area of the restaurant in the 4000 block of Suitland Road in Suitland, Maryland, in the early hours of Sept. 20, police say.